Coconut oil is widely used in India, and its easy to see why. Indian women are known for their long, healthy tresses. If you have dry, damaged hair from excessive coloring, perming, or relaxing, then this tip will be especially useful for you. But if your hair is already relatively healthy, then using coconut oil will make it thicker, more shiny, and lustrous. Here’s how to do it: For this, you need to have clean, dry hair first. Apply the coconut oil onto your scalp and hair. Work it into the hair thoroughly with your fingers. Wash your hair using your regular shampoo. Try to do this at least once a week and damaged hair will strengthen over time. My naturopath also recommended this. my hair is sooooo damaged i’m talkin, bleached numerously and died numerously in a period of one or two months, it falls out so much and all over and its so weak. school starts soon and so, can you use this more than once a week ? Hi, you can use coconut oil safely every day if you want to. Coconut oil is part of daily hair care for many South Indians. You might also want to try castor oil on some days. One commenter had good results with using castor oil on damaged hair. Yes, you can also use coconut oil in your hair that way. I have been using this since I started coaching cheerleading and was nervous when some of the girls were said to have lice here and there, Although Lice seem to be a staple part of growing up, I wanted to take precaution and honestly when my kids did get it (only once) I was the only one who didn’t have it. Even my husband (with whom I share a bed) got it but I didn’t and at the time I had no idea about the extra benefits of coconut oil. I dye my hair ALL the time, Bleached highlights, dying it dark, then light, I went to get my hair cut and they were amazed at how healthy my hair was! Once a week I saturate my hair, Pull it back into a ponytail and just leave it over night, I don’t even use the cap I just go about my normal cleaning or whatever, and the next morning I wash my hair and VOILA, I have Nicer, less frizzier hair! And I am amazed at all the products I use and coconut oil is about $1.99 for a small jar that does last a little while! It’s even worth just trying! I swear by it and will use it forever! Hi Jaime, isn’t is great that this stuff is so cheap? 🙂 Thanks for sharing! I oiled my scalp with coconut oil one day and my head was itching so bad. My daughter did the same thing and hers itched really bad too. I dont you should leave it in over night. I think you should follow the direction at the top then wash it out!! I use Coconut Oil three times a week. I leave it in my hair overnight and wash it in the morning. I use to blow dry and straight my hair almost every day, I had extremely damaged thin hair. They were so bad that I decided to trim them because the split ends really embarrassed me. my sister, on the other had was using coconut oil and had thicker, shiner, and long hair that grew faster then my hair. When i started using it i saw how well it worked within a couple of weeks. The first thing I immediately noticed was that my hair wasnt falling as much as it use it. I now still blow dry and straight my hair, i have NO split ends, my hair is thick and shiny. It took about a year to get like this. So please be patient! Thanks for sharing that, Sara! I am indian and I use coconut oil since my child hood for hair care. It is best ever!! As I tried many hair spas , hair treatments n best shampoo and many other hair products . One tip for all of you who tried or gonna try coconut oil for your hair. Take one bowl full of coconut oil approx 3/4 put the bowl having bubbling water . And add 12 to 15 dry fenu grek seed in it. Than keep itaaside for an hour approx. now apply that oil in your scalp and massage gentally. You will get relax from dandruff also via this and hair will get extra shine too. Thanks for the tip Minmi! For anyone who’s interested, there’s more info about fenugreek seeds here. Hi sushuma, it’s possible that your hair loss is due to a poor state of internal health, rather than the condition of your scalp or hair. 2) Also, most store-bought shampoos contain many toxic chemicals. IMO, it’s better to go natural, especially if you’re in poor health and your system cannot remove the toxins effectively. 3) Most commercial shampoos contain sodium laureth sulphate (SLS), which can cause dandruff and many scalp/hair problems (the irony of this is not lost on me). hey!! i used to put coconut and amla oil in my hairs and they where thick long and shiny but when i came to America i just stopped using it.and then i got hair rebonding done too. and i guess becoz of that my hairs are too weak,thin and keep falling,i have one third of my original volume of hairs left..and after reading all these articles i am going back to my oiling.this time i am using castor and coconut oil mix.so i hope it works again.is there any suggestion about adding any other oil to my oiling regimen to make them strong.??? Hi harpreet, another commenter (minmi) above recommended adding fenugreek seeds to oil. It sounds promising. hi i wana know can i mix coconut oil with almond oil or not?though i havent used yet but hoping for good result.im going to use parachute coconut oil,can u tell me is it good name for using or not. Hello, does it matter if I use extra virgin (as shown) or organic coconut oil? Hi Chris, if you can get it, extra virgin or organic oils should be more nutrient-rich and contain fewer/no chemicals. However, refined coconut oils (like the Indian ‘Parachute’ brand) have also worked well for many people and are significantly cheaper. So it’s really up to you. I have very fine hair, light ash brown naturally that is very resistant to blonding under the wrong hands. I moved, and had to try a new colorist and she overprocessed my ends so badly they were stretchy!! Found a much better hairstylist and am slowly growing out the damage. I am not willing to cut my hair short, so I have been trying a multitude of products to make my poor dry ends look healthy and soft. Nothing I’ve tried has been terribly effective. I bought the Shielo brand Antioxidant Leave In Protectant from Shielo’s website. I applied about 4 times and worked it through my ends and up to about chin level and immediately my hair was easier to comb. Upon drying and styling, it truly looks like my hair was never even damaged in the first place. I STRONGLY, highly recommend this product to anyone with overprocessed ends. I’m sure it would work great on other hair types too. I use coconut oil internally and on my hair. I use it straight! (no mixing with other oils) although I am going to try a mix with castor oil. The coconut oil does strenghten my hair, It is much healthier and I did notice, the gray doesnt seem to be coming as quickly. A fluke? I will post back and share if this continues. That’s interesting about the grey not coming in as quickly. Thanks for sharing, Kate! 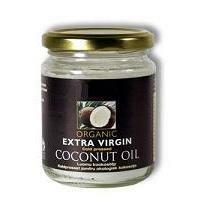 I have just purchased a large pot of extra virgin organic coconut oil from amazon (£17 including p&p for 1.5kg)! much cheaper than anywhere else I have tried. I have also heard that it helps colour last longer on hair! Going to try it tonight as an overnight hair mask and cannot wait to see if it hydrates my hair, as it is very dry at the moment! i have long strong hair bt recently noticed that my hair is falling and bits of it remain in the comb. please help me with a remedy for it. I have been using Organic Extra Virgin Coconut Oil for a week now on my hair, face and body. I also use it on my 10 month old daughters hair and body. It is a wonderful moisturizer and adds a lot of sheen to my thick curly/corse hair. I did a ton of research on coconut oil before buying it and it seems to be one of the few if not only oils that has molecules small enough to actually penetrate the hair shaft. Do not purchase coconut oil that does not say organic and extra virgin! Those are refined and does not have as many nutrients in them with added chemicals. Coconut oil does stop hair loss, color loss and protein loss. I used to use olive oil, jojoba oil, avocado oil and many others but none of them seemed to actually nurish my hair, just layed on top of my hair making it look greasy. Coconut oil soakes in to my hair and made it soft and less frizzy! as far as BABES comment, you may want to get a trim to stop the hair loss and if you are not taking a good multi vitamin, I would definitely start looking into doing so. I have not had a trim in a year and i have almost no split ends and little hair loss. I think it’s because of the prenatal vitamins i have been taking. My 60 year old aunt swears by prenatal vitamins (she still looks like she is 30) so I will just keep taking them as well! I have mixed hair so I wash and condition my hair and then apply the coconut oil to my hair along with Garnier Fructis conditioner (the pure one with out any chemicals), twist my hair in sections and once it is dried I pull the twists apart! Easy and Pretty!!! I don’t think that i will ever straighten my hair again! Shana, what brand of of prenatal vitamins are you taking? Hey Diane, I am taking a generic prenatal plus vitamin. I heard that people get sick from their prenatal vitamins but I never had a problem with these. Oh and an update on the coconut oil: Unfortunately it dried my skin out along with my babies skin but I do still use it in my hair. This week I am going to try it as a pre shampoo treatment because I found that I was breaking out on my face from using it as a hair cream, but it moisturizes so well that i am not willing to give it up completely! So were do u get the extra virgin coconut oil at???? You can find ev coconut oil at trader joe’s. hi I wanted to ask that if its written organic coconut oil and naturally refined will that work to thicken my hair.